Born into a legendary Boston firefighting family, phoenix shifter Ryan Fiero can’t possibly let someone best him on the training course or the job. He’d never hear the end of it. When a feisty new recruit comes along who’s determined to do just that, Ryan plots to kick her out-until their sizzling chemistry turns explosive. Lately, I’ve been finding that I quickly lose interest in books with long drawn out angst and drama between the main characters especially when they get past the twenty percent mark with nothing else happening and I was going to give up on this book for that reason, but having read the previous book and enjoyed Chloe’s character, I was hoping that it would improve, which thankfully it did. Becoming a firefighter is a natural progression for dragon shifter Chloe Arish but with only one job opening and a competitor for that slot, Chloe is determined to nab it and her audacious play for it is both hilarious and unexpected but her competition is no slouch either. Phoenix shifter Ryan Fiero is from a legendary family of Boston firefighters and pretty much expected that his family cred would put him over the top for the job since acing the tests was an easy feat and was not prepared for any competition, let alone from a woman. And a rivalry is born. Both Chloe and Ryan have supernatural abilities and everything is an opportunity to outdo the other, but the attraction between them changes their relationship from frenemies to something else, although not without a lot of friction. Chloe is a firebrand (pun intended) in every way. Independent and tough, she has no idea how attractive she is nor how to capitalize on her looks, she only wants to be respected for her skills. For Ryan, dealing with Chloe is a balancing act that can be difficult sometimes as he swings between being protective of her and letting her take care of herself. With a stubborn Chloe and an overconfident Ryan comes a lot of drama, a lot of it funny and lighthearted, including as well-meaning but overly interfering family members, but will the secrets they are both keeping from each other help or hinder their relationship? And will Mother Nature be a help or a hindrance? 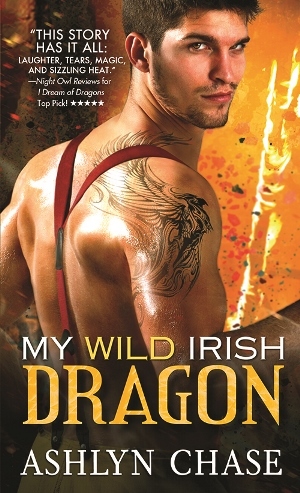 Overall, MY WILD IRISH DRAGON is a very entertaining addition to the series. I loved Chloe but Ryan was really not my cuppa because he came across as a bit immature and annoying sometimes. My advice to readers is to go with the flow of the story in order to enjoy it and not pick apart the details.